What are the pesticides used to grow Christmas trees? Information on pesticides used in the Christmas tree industry in western North Carolina is based on grower surveys conducted among Christmas tree growers. There have been five surveys since 1995, each asking growers questions about what pests were a problem the previous year and how they controlled them, including which pesticides they used. The following tables summarize the results, listing the labelled pesticides that are used on at least 3% of the Christmas tree acreage since 2000. Please note that pesticide usage continues to change and these numbers may not reflect current usage. How do growers know if they need to apply a pesticide? What else do they do to control pests besides pesticides? Growers are encouraged to use Integrated Pest Management (IPM) to control pests. Integrated pest management is a system of pest control methods that uses appropriate cultural practices and pesticide selection to reduce pest problems. Scouting is key to IPM. Most pests of Christmas trees can cause considerable damage if left untreated. Scouting fields on a regular basis to estimate pest numbers is required to learn if a treatment is necessary. Growers use a handlens and tree symptoms to find pests as well as natural predators in the field. Scouting occurs on a regular schedule with multiple trips to the field. In 2018, 83% of growers reported scouting before they treated for pests and 21% of growers reported delaying treatments based on the presence of predatory insects. 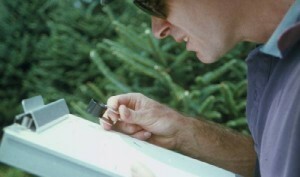 Other IPM practices that growers use to combat pests include: site selection, early harvesting of damaged trees, proper shearing and fertility practices, encouraging natural predators by keeping ground covers around trees and the carefully selection of pesticides, and not interplanting young trees among older trees (pests get on the smaller trees sooner than they would have). Why do they have to use herbicides? Why can’t they just mow? Growers prefer using herbicides to mowing or using a weedeater for several reasons. From the grower’s point of view, it’s quicker and cheaper to apply a herbicide than to mow. However, it’s also better – both for the tree and for the environment. Mowing and weed eating can damage the bottom limbs on trees and even kill trees if the trunk is girdled. Mowing also encourages grasses to grow, which can choke out trees or grow up into the tree making weak bottoms. And mowing is also less environmentally friendly because of the gasoline and oil required to run them. Most herbicides are applied with backpack sprayers which are pumped manually. Many growers use a technique called “weed suppression.” Originally developed at North Carolina State University by Dr. Walt Skroch and others, weed suppression uses lower than labeled rates of herbicides to stunt rather than kill weeds. For instance, Roundup is labeled at 32 to 160 ounces formulation per acre. But Christmas tree growers in western North Carolina use rates of 4 to 8 ounces per acre to stunt the weeds so that they don’t grow too tall. This treatment lasts 4 to 6 weeks before another application is required. Growers may treat two or three times through the growing season with Roundup at low rates, then come back in the fall and treat problem weeds such as briars and poison ivy at the full rate to eliminate these weeds. This type of ground cover management results in a shift of common ground covers away from grasses which are competitive to the tree to small woodland perennials that are far less competitive. That’s because these plants are more tolerant to Roundup and aren’t killed by the lower rates. Clover is a common ground cover that fills in the places between trees with this type of management practice, as are dandelions, nimblewill, wood sorrel, and violets. Clover and bird’s foot trefoil are also being sowed by growers in cleared land or other sites where appropriate ground covers are not present; these are then managed further through weed suppression with Roundup. The bottom line — IPM works! Over the past five years (from 2013 to 2018), Fraser fir Christmas tree growers have reduced their pesticide use by 21%! They have also reduced fertilizer use and created more green-space for wildlife and pollinators including bees. IPM reduces costs and improves the environment — a win-win for everyone!